YOU HAVE A PROBLEM WE HAVE THE SOLUTION!! Sitting, Standing, Inside, or Out. This Stand is Great For All. 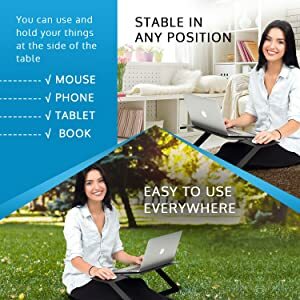 While The Glare Of The Sun May Be Hard To Fight Outside, Positioning Your Laptop No Longer Will Be! Fully Adjustable for 0" - 19". ✅Sit Down With Your Laptop Eye Level! 50% OFF! NEXT 200 CUSTOMERS ONLY. Have you heard of "Text Neck"? Surely you've experienced it if you have been using your phone a lot in a given day. We do the same with our laptops. Since our neck is always looking downward, with our back hunched over, this causes neck strain & tension. 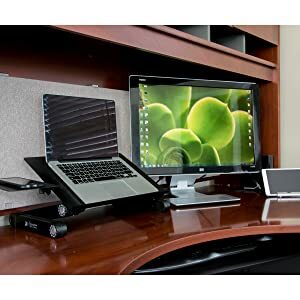 The Executive Office Solutions laptop stand is the perfect solution whether using it on the desk, couch, bed, or as a standing desk. Propping Your Laptop Up to Eye Level Beside Your Desktop And See How Much Less Your Neck Will Hurt After a Day's Work! We have 24/7/365 Email Support. All of our products are processed within 5 business days but during peak times such as holiday seasons and public holidays this may be delayed slightly. Most of our items are shipped everywhere in the world and it will take 10 - 21 days as we select a balance of the fastest and cost-effective shipping offered. The item came super quick I was really surprised! It came in less than three days and I was very satisfied with what I received. Totally recommend this seller! Get yourself a nice, cool looking computer desk!!! Thank you for delivering it so quickly. The build quality seems decent. The frame is metal but the joints are mostly plastic and I am not sure how much time they would last. I used it already one day and it does the jobs well so if it proves to be durable enough over time, it's well worth the money. I will report if there are any issues down the road. The table is a little soft, that does not affect the your usor. great item but a little bit hard to use.